It’s raining out. My boyfriend gets home from a hiking trip today. Two perfectly sound reasons to bake. I chose a Small Batch Vanilla Cupcake recipe, which turned out well. It made exactly six golden cupcakes. This would be the only success of my day. 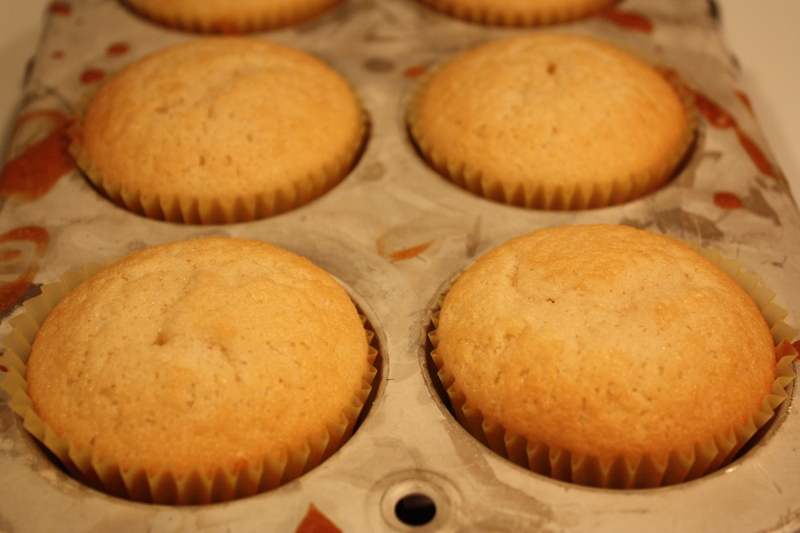 Preheat oven to 350 degrees and line a six-cupcake pan. 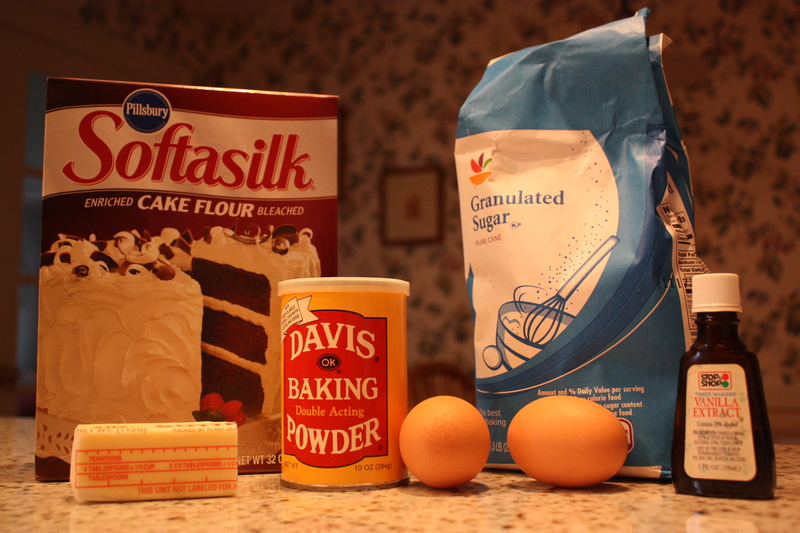 Combine and mix flour, sugar, baking powder, salt. Add stick of butter and the milk. Mix with an electric mixer for two minutes until fluffy. Whisk egg whites and vanilla in separate bowl until combined. Pour slowly into the batter and mix on medium speed until just combined. Bake 20-24 minutes. A toothpick should come out clean when inserted into the cupcakes. Okay, so those turned out wonderfully. And now here is why I sometimes doubt my cooking abilities, or general intelligence. I wanted to try a chocolate frosting recipe, involving sour cream, semisweet chocolate, corn starch, vanilla and instant espresso. Everything looked great. The chocolate came together nicely, but the end result had too much tang from the sour cream. I added corn starch, but then it was too sweet, with a tangy aftertaste. Then I remembered my boyfriend hates sour cream. So in multiple respects, my first chocolate frosting of the day failed. In an attempt to reclaim my confidence in frosting-making, I tried a vanilla frosting recipe from the New York Times Cookbook. That ought to be tasty, right? Well, it probably would be, if I had enough confectioner’s sugar. I realized while the butter and granulated sugar was boiling on the stove that the box of confectioner’s sugar in my cupboard was empty. I never understand how empty boxes of food end up in my cabinets and not in the trash. But alas, I had been teased and did not have any confectioner’s sugar. So my second frosting of the day failed. I guess this is why I do not own a cupcake store. The next step in my rainy day baking project was one I hate to admit: I bought a can of frosting at the supermarket. I’m sure that’s the number one thing all the famous food bloggers would never do, or at least never admit. I don’t even want to know what sort of junk is in the frosting, but I can tell you one thing: it tasted a hell of a lot better than the stuff I had been concocting. I enjoyed eating a knife-full of frosting once I was finished. It was a closed-eyes-saying-mmm, hoping-no-one-is-watching sort of enjoyment. I think this is firm proof that I will not, in fact, be the next Martha Stewart. I know, I know, you’re shocked.